Tester's Vermont Christmas Trees-- Your online source for Vermont-fresh Wreaths, Christmas Trees and hand painted ornaments! Happy spring almost summer everyone! As the spring weather gives way to summer, we have finished our planting and now the trees have broken bud and are growing new foliage at a fast rate. We are starting our fertilizer regime with both granular and folier feedings. There is quite a strong demand for real trees as we can attest to by the advent of early inquiries coming in from large wholesale buyers! After a month of growth we will start shearing the Balsam trees, then on to the Frasers. The work is never done, as well as the need to educate oneself to do the best job possible in order to produce the best trees for all of you, but as always, I look forward to the challenge. Don’t hesitate to call , no question is too small!! From all of us at Tester’s Vermont Christmas Trees. Tester's Vermont Christmas Trees is nestled in what is known as Vermont's Northeast Kingdom. Our family-owned farm consists of 6 plantations within a 50-mile radius, where we grow Fraser fir trees, Balsam fir trees, beautiful hybrids, and firs for making Christmas wreaths. An elevation of approximately 2000 feet enables us to grow a hardy Vermont Christmas tree with deep color and good needle retention. We are very pleased to be able to offer our Christmas trees and wreaths directly to you through our online store. Many of our Balsam Christmas trees are of the Cooks strain or Mountain Balsam variety. The short blue/green needles have many of the same qualities as the Fraser, and make beautiful Christmas trees or wreaths. We take an aggressive and intensive approach to growing on our plantations, and all our Christmas trees are fertilized and monitored for insects or other pests regularly. We have been in business for 25 years, have grown every year, and now are one of the largest growers of Vermont Christmas Trees. We are one of the few farms in the state that grow Fraser fir trees in any quantity. Our Christmas trees are available to wholesalers or to retail customers online, or join us on our farm to select or cut your own tree for Christmas. Come by weekends during the holiday season, and enjoy a hay ride to the trees to cut your own, or have a nice cup of hot cider or cocoa on the house! 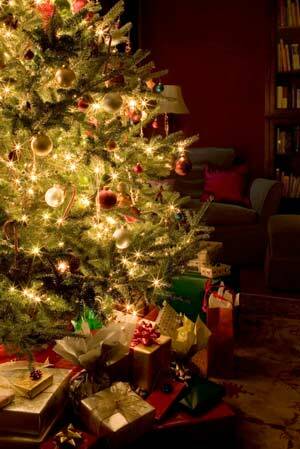 Tester's Vermont Christmas Trees - make us a part of your holiday tradition! We offer Wholesale Christmas Trees and Choose and Cut Christmas Trees right on our farm in Barton, Vermont. We also have a retail location in Niantic, Connecticut.